This petition has been created by Toine K. and may not represent the views of the Avaaz community. The Norwegian state - proud of its high standards toward human rights - forces the Sámi indigenous people to slaughter their reindeer, bringing young herders with small herds to bankruptcy. Young Sámi reindeer herders - the fragile link for recruitment - are forced away from their traditional livelihood, culture and inherited rights. Sustainable reindeer herding is a crucial element of Sámi culture in the European Arctic. Forced culling of the Sámi people's reindeer is imposed for so called environmental reasons and presumably to protect the land for future reindeer herding. At the same time the Norwegian state expropriates ever more Sámi land for development purposes and industries such as oil, gas and intended mining. Overlooking these severe ecological threats to the environment and the arctic pastures, the Norwegian government forces slaughter upon reindeer herders to a financial unsustainable level. Those who refuse the slaughter of their herds face tremendous daily fines, leading to bankruptcy, and are thereby forced away from their traditional livelihood, culture and inherited rights. The young herder Jovsset Ánte Sara has legally challenged the imposed culling. He has twice won on human and indigenous rights grounds. In highest appeal the Norwegian supreme court judged in favour of the state, deciding that the state knows better what is good for the Sámi than they do themselves. Sara has sent his case to the UN Commission on Human Rights. While the fate of Jovsset Ánte's herd and livelihood has been sent to the UN Commission, the Norwegian government ignores the future outcome of the case and forces him to slaughter his herd by 31st of December 2018. The decision will strip a young Sámi of his internationally recognised indigenous, human rights and will bring dramatic negative impact not only on his personal economy and health, but also on the general legal standards of Sámi reindeer herders. or see the facebook page ProtectSami. Stop the slaughter of Jovsset Ánte's herd until the UN Commision on Human Rights has given its verdict in his case. Stop destroying lives and culture of the indigenous Sámi people. 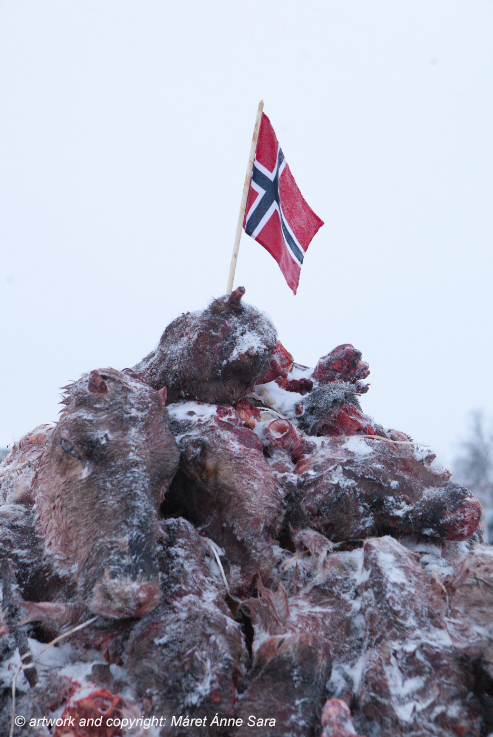 Urge the Norwegian government to refrain from destructive politics and laws towards their indigenous peolpe.
" We, citizens from all over the world, are concerned about the treatment of indigenous Sámi people in Norway, concerning their rights, culture wellbeing. We ask the human rights of Sámi reindeer herders to be respected, that the cultural rights of the Sámi people, their livelihoods and society are respected, that Sámi reindeer herders health is ensured according to international human rights and that laws and politics regarding Sámi livelihoods permit their people and culture to survive. We urgently ask you to refrain from fines and further reindeer slaughter commands against Jovsset Ánte Sara and other Sámi reindeer herders, at least until the UN Commission on Human Rights has reached a decision in Jovsset Ánte Sara's case. "